Dental implant restorations, also known as prosthetics, are replacements for missing teeth. 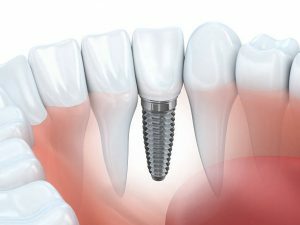 The dental implant is surgically placed in the jawbone to replace the root of the missing tooth and provide a stable foundation for the implant restoration. A period of healing, which usually lasts a couple of months, allows the jawbone to begin to bond with the titanium implant. Your talented dentist, Dr. Clive Rosenbusch, will then place the dental implant restoration over the titanium implant. The implant restoration replaces the crown of the missing tooth and restores the appearance, function, and health of your smile. In addition to being fitted with a crown, dental implants can also serve a support role for dentures as well. Just one or two dental implants can significantly improve the comfort and functionality of your dentures by anchoring them in place. Similarly, dental implants can also anchor dental bridges as well. If you are seeking exceptional comfort when wearing your dental restorations, dental implants may be the optimal solution for your dental needs. If you would like further information about the benefits of dental implants, we invite you to call or visit the office of Dr. Clive Rosenbusch today to learn more about dental implants in Boca Raton, FL . We look forward to restoring the beauty of your smile!